Portable Foldable Travel Sail Kit for DIY Sailing Project. New Folding Lateen Sail Kit Rig. BoatsToGo offers new and improved lateen sail kit that is great for all your Do-It-Yourself sailing projects. Large, 45sqf sail offers great performance, but still can break down to fit into portable mesh storage sleeve. New Sail Kit can be installed in many types of inflatable and hard hull boats, canoes, catamarans, etc as a DIY project. 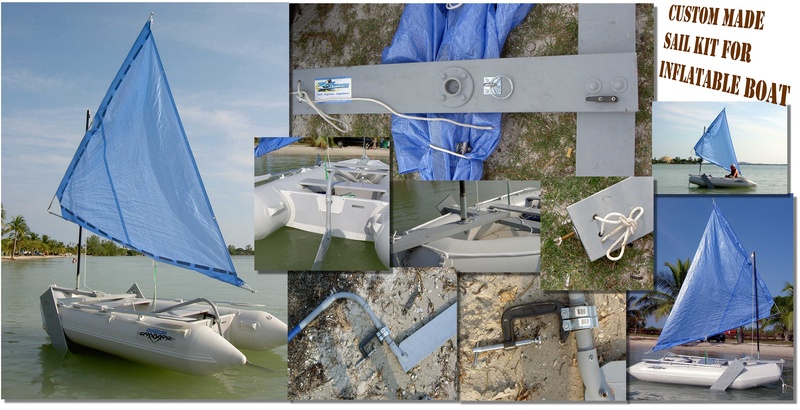 Sail kit consist of heavy-duty aluminum mast, that breaks into 2 pieces, and 2-part booms. To fold sail, you will simply raise lower boom along with sail toward mast, and then secure with optional bungee cord or rope. Please note that this is DIY kit, and it is up to the customer to decide how to install and secure sail to their watercraft. We do not provide any particular instructions or suggestions for this matter. Sail kit comes with a heavy-duty aluminum flange that can be bolted to most flat surfaces. Included FREE Mesh storage bag. Plenty of ropes and straps for various installation options. 2 aluminum tubes for mast. 4 aluminum tubes for boom. Aluminum flange for mounting on flat surface. "I got the sail kit today. As active sailor for more than 65 years, I can confirm that I never have received so much sailor stuff for so little money. High quality! It is thanks to you that the price is kept so low that retired guys like me can have so much fun for only $200!" Steen, Denmark. This item is NOT available for shipment arriving 02/03/16. Example of mounting sail kit on inflatable boat dinghy.